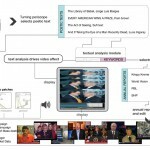 sub_scape PROOF is a datamapping system with video of the pulpit-like rhetoric of the professional politician; ‘secular confessional’ TV; advertisements, and TV reportage with its increasingly value-added, Baroque display. sub_scapePROOF was commissioned by the Australian Centre for the Moving Image for the exhibition “Proof – the act of seeing with one’s own eyes”, Melbourne 2004 – 2005. A single channel machinima version (5mins duration) is available. Mapped through this video/audio data stream are literary texts that represent some axiomatic notions about truth, discourse and affect. Jorge Luis Borges’ parable of language The Library of Babel; a Sufi text titled Seeing which contrasts the western-leaning, neo-Aristotelian philosopher Avicenna’s focus on universals, with Sufist consciousness of the ‘now’; a short poem Every American Wins a Prize, by Australian Pam Brown, which acts as a commentary on commercialisation and the Americanisation of topos; and an excerpt from “..and if, taking the eye of a man most recently dead…” Descartes via feminist Luce Irigaray , who is known for her complex linguistic, philosophical and psychoanalytic precepts. As the sub_scape system maps these texts onto the video stream, key words in the texts – for example, trust, insinuate, fact – trigger the introduction of another set of data, representing a third type of ‘truth’: the annual reports of various multinational companies involved in the insurance, telecommunications and manufacturing. 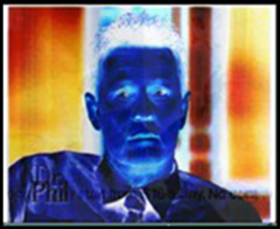 sub_scapePROOF critiques the notion of evidential, superficial “truth” in a post-faith age. By mapping philosophy and corporate data back onto the language of superpower politics and western, pathological tropes of fear and anxiety, sub_scapePROOF generates a playful and ironic critique on the traditional politics and power dynamics of knowledge-through-mapping. By playing on the emergent aesthetic and sense-making behaviours of the datasets, by using the dynamics of turbulence, balance, recursive effect and pattern formation in the data, sub_scapePROOF transmits an affect of ‘truth” more baroque than Cartesian, and “meaning” more symbolic than fixed. This project was a collaboration between new media artists Sarah Waterson and Kate Richards. MaxMSP programming by Jon Drummond. sub_scapePROOF is created in MaxMSP and Auvi. It is housed in a periscope object for single visitor use. The periscope has an in-built LCD screen. The visitor views the periscope display from a seated position. Turning the periscope changes the data flows and effects. subscapePROOF can also be configured for alternate display such as wall projection. Periscope dimensions: Approximately 140 cm H and 55 cm Diameter, weight 26 kg.